The headline above announced the first major step forward in providing a Museum for Alresford when eighty years after the last fire engine left the Old Fire Station in Alresford the building once again houses a fire appliance. One of the old Merryweather Steamer Pump appliances built in the 1890s and similar to that operating in Alresford in the early part of the twentieth century, was moved into the Old Fire Station on Saturday 18th August. The Old Fire Station is owned by the New Alresford Town Trust and the original part of the building that formed the fire station has been refurbished to provide a new Museum for Alresford and house the old steamer fire engine. The original idea was to create exhibition and display space for local historical artefacts in the Old Fire Station but when the possibility of actually housing a local, vintage fire engine became a reality our plans changed and the focus now is on preparing suitable displays to complement the fire engine and open the Museum to the public. We are grateful to the Hampshire Fire Service, Alan House and the Hampshire Police and Fire Heritage Trust for their help in making this project a reality. During the Autumn we have held three open days when the Museum has been open for residents and visitors to view the 'Old Steamer' and related fire service artefacts. Over the winter months we will be working on the display of other artefacts that tell the story of Alresford over the centuries. We are grateful for the financial support from Hellards Estate Agents and we hope to be able to open our doors in early spring as a more comprehensive local Museum. With a limited number of objects our displays are currently limited to themed presentations in sites hosted in buildings in Broad Street. First there is a glass display cabinet in the Alresford Library, under the stairs: here three of the town Maces originally used by the Bailiff and Burgesses are usually on display, with other items selected from the Museum artifacts or on loan from townspeople. Second, across Broad Street from the library, in the passageway to the Courtyard café, there is a display of old photographs of the town from the Alresford Heritage collection. Without a building, the obvious plan has been to use this web presence to provide as much information as possible to web visitors, and this website offers eight routes to search and view our collection. We are planning to develop this as the main access route, providing photos and videos and copies of documentation possibly more easily than in a physical library. Archeological Finds. We have been working with an established and well respected archeological metal detecting group to survey open areas of Alresford. the finds are listed in this section. Videos. Old Home Movies converted to video format. Heritage photos, that is photos from before WW2, by access to the Alresford Heritage web collection. The Alresford Heritage website and the Alresford Memories website have been operating for some time. Now also available is the Photo Gallery, where many of the photos in our collection are already on display. Lists of the Artifacts, Archeological Finds, Documents & Books and Pictures & Art, we care for are now listed and we will continue to add further information links that can be accessed from these listings. The Alresford Museum has established links with associated organizations, such as the Hampshire Record Office (HRO). 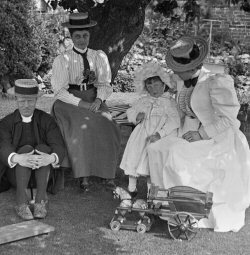 We have scanned their collection of Black and White glass negatives and these images can be viewed in the photo gallery. All artifacts found in the local metal detection searches managed by the Museum are processed through the relevant Finds Officer, and these are now listed. We also scan the photographs and documents in our possession, and lodge copies with HRO for safe keeping. The Museum also has close links to other local organizations, such as the Alresford Historical and Literary Society, which publishes an annual magazine of relevant research articles about Alresford, called Alresford Articles, as a successor to the similar Alresford Displayed series of annual publications, which started in 1976. We intend to collect and catalogue photographs, documents and artifacts which will illustrate the story of Alresford and the immediate surrounding district, so that we can set up displays and exhibitions which will be interesting and educational. Artifacts continue to be forthcoming as our existence becomes known. In the absence of a group dedicated to this goal valuable material tends to be lost forever. We hope that this will not now happen. So if you have material which you think might be of interest please let us know, and at least enable us to record it. Artifacts related to the old crafts of the area, for example sheep rearing, fulling of fleeces, brewing, building, watercress growing, fishing, eel trapping, and voluntary and community services. Artifacts showing how local people lived in the past. If in doubt please do talk to one of our group. Remember photographs which are not very old now will become significant in 50 - 100 years time. If they relate to Alresford, rather than throw them out, pass them to us for posterity. We would also welcome promises of material in the future and funds now. Since the Museum is part of the Town Trust who are a registered charity no. 239052, we could get 25% back from the tax man if you give by Gift Aid. Please contact one of the following for more information, to donate documents, photographs, artifacts or money, or for more information: Roy Gentry, or Robin Atkins. The Museum was originally conceived by Roy Robins who established the Alresford and District Museum Trust as a charity in April 2006 but the initial enthusiasm was lost on his death in May 2007. Their achievements over that short period were limited but they did manage to raise over £10,000 towards their endeavour. Ill health and the death of Trustees resulted in the Charity and the initiative failing and the Charity was removed from the register in 2009. There are strict rules on how a charity can dispose of its assets but in essence they can only be transferred to another charity. This is where the Town Trust stepped in during 2011 and the Charity Commissioners agreed to the funds being transferred to the Town Trust as an established charity. We now have to pick up the reins where they left off! Alresford Crafts soft toys and dolls are well known, and often sold on internet auction sites, as collector’s items. The Alresford Museum has acquired a collection of these soft toys, including the hedgehog, kangaroo (with a baby), Teddy bear, Polar bear, dinosaur and squirrel. 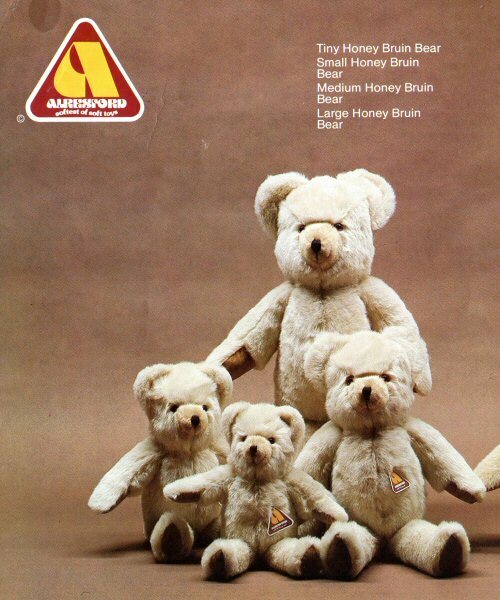 One of the Alresford Crafts Teddy bears, known as a Honey Bear, was said to be unique in that it was designed to have a flat bottom, which made it easy to bend its legs and make it sit down properly, without having to lean against anything. For around 25 years Alresford Crafts was a major business venture in the town, making dolls and soft toys.Perhaps more than any other, this business promoted the name of Alresford to consumers across the world. John and Margaret Jones started trading from the two lower floors of the Town Mill, a building at the bottom of Mill Hill, Alresford, which dates from 1189. In 1977 Alresford Crafts started planning a workshop where doll’s heads, hands and feet could be produced. Initially these were made of bone china, but then production switched to using porcelain. They were proud of producing their dolls wholly in England, and did not call their dolls ‘China dolls’. In fact the company adopted a logo that just used the word ‘Alresford’ – and so had to add a subheading of “…say it Alls-ford” to help with the problem of pronunciation, particularly for the Chinese and Japanese people, when trying to order the dolls! The Alresford Crafts business closed in 1992, with a major sale of the remaining stock, attended by most of the ladies of Alresford. Read the full article. The Museum has also acquired a number of the catalogues, price lists amd marketing material which are listed here.